We’d love your help. 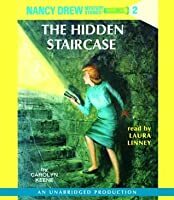 Let us know what’s wrong with this preview of The Hidden Staircase by Carolyn Keene. After receiving a call from her friend Helen Corning, Nancy agrees to help solve a baffling mystery. Helen's Aunt Rosemary has been living with her mother at the old family mansion, and they have noticed many strange things. They have heard music, thumps, and creaking noises at night, and seen eerie shadows on the walls. Could the house be haunted? Just as soon as she hangs After receiving a call from her friend Helen Corning, Nancy agrees to help solve a baffling mystery. Helen's Aunt Rosemary has been living with her mother at the old family mansion, and they have noticed many strange things. They have heard music, thumps, and creaking noises at night, and seen eerie shadows on the walls. Could the house be haunted? To ask other readers questions about The Hidden Staircase, please sign up. I have never read 'the hidden staircase' but one of my friends told me it was really scary. Is it? Is it really scary or not? MysteryReaderLee It is not too scary. It is a really good book and I highly recommend it. You're never too old to re-read childhood favorites. I'm currently working my way through the Nancy Drew hardcovers. In this book, Nancy discovers a hidden staircase and solves the mystery of unexplained happenings at the mansion. A quick, easy read with an element of danger. I blame these books for my first recess of having to sit on the bench while the other kids played. It was third grade, I was reading one of these under my desk during math time, and totally got caught answering, "Wha-hu?" instead of the answer to a long division problem. It was traumatizing, I had never been in trouble! (Except that one time we got in trouble for throwing snowballs on the playground in the middle of January. No, really.) But it tells you how much I love these books that I didn't I blame these books for my first recess of having to sit on the bench while the other kids played. It was third grade, I was reading one of these under my desk during math time, and totally got caught answering, "Wha-hu?" instead of the answer to a long division problem. It was traumatizing, I had never been in trouble! (Except that one time we got in trouble for throwing snowballs on the playground in the middle of January. No, really.) But it tells you how much I love these books that I didn't care! In fact, I think I went right back to reading the next day. I had the ones with just these exact covers, too. I must've had at least thirty of them, if not more. They consumed pretty much the entire third grade year. Recommends it for: Kids like me! Nancy's father goes missing. Helen's great grandmother Miss Flora's Twin Elms home is haunted, a mystery which Nancy decides to investigate upon her close friend Helen's insistence. What would Nancy Drew do? Go after her father or help her friend? Imagine Nancy's surprise when Nathan Gomber, the very man who threatened Nancy's lawyer father, turns up at Twin Elms to coerce Miss Flora into selling him her much vaunted colonial house. Ah, (view spoiler)[ha-ha, I got you, nothing here, this is Nancy Drew after all! *smirks* (hide spoiler)] Nathan Gomber, do you smell a rat? ⭐Buddy read(yes, my first BR with any of my GR friends) with my sweet big sis, Emer! Together we recreated our respective childhoods- hers in which she hid the book under her pillow just in case Nathan Gomber and the Ghost decided to creep out of the pages of the book and materialize in her room, mine in which Nancy Drew was totally unheard of. We could have giggled like two happy little girls at the all-too-perfect ending, but life got in the way. I hope you are recuperating faster than we all want and I am sure all this little hazy feeling will pass in no time. I know that the fighter in you will brave all odds and pains, just as sure. Is it a wise decision to re-visit a series that you adored as a child as an adult????? They say you can never truly go back….but maybe you can a little?????? A short while ago my lovely Goodreads friend Adita read and reviewed the first book in the Nancy Drew series; you can read that wonderful review here. This review brought back the most wonderful memories for me and so I decided to partake in a little nostalgia and join Adita in her Nancy Drew reading quest. And I am so very pleased that I did. Nancy Drew is still as appealing to me now as when I was a little girl. •	Her love and respect for her father, the closeness of that relationship. All these things add up to a wonderful role model for young girls and looking at this book with grown-up eyes makes me confident that these books certainly enriched my well-being as a child and had a positive influence on me. Okay things have dated somewhat but the heart of the book…. Well that is still true. And isn’t that what is important??????? What are the key things that make a Nancy Drew book exciting to read?? ?....well this book had it all!! Sneaky ghosts, shady characters, secret passages, haunted houses, mysterious footprints… I was actually pleasantly surprised at the level of tension in this book! I found myself getting quite caught up in the storyline and had the constant sensation that something or someone was going to jump out from behind a closed cupboard at any minute. I remember as a child reading a Nancy Drew book entitled the Ghost of Blackwood Hall and being TERRIFIED!! This book reminded me very much of that experience… okay so the 2016 version of me was somewhat less terrified but I still got a little adrenalin rush!!!.... Ok so I got scared…what can I say? I’m a wimp!!!!!!!! Will I read further books in the series? I hope to. This book had no Bess Marvin or Georgia “George” Fayne, Nancy’s best friends… and I would very much like to meet those characters again. There was also no Ned Nickerson, Nancy’s long-term boyfriend. Instead Nancy went out on a date with some guy called Dirk….DIRK!!!!!! I KNOW!!!! Where did he come from all of a sudden????? Dirk Jackson, ”a red-haired, former high-school tennis champion”!!!!! All the time I felt like screaming NOOOOO where’s Nick???????? I felt like Nancy was cheating…ok I’ve since looked it up, apparently Ned doesn’t arrive on the scene until book seven in the series but OH that felt shocking to me!!!! I am going to leave this book unrated as I cannot make up my mind as to what rating it deserves. My inner child wants to scream five, five, FIVE… But the adult version of me is unable to reconcile with that decision so I will just leave it to the younger members of our Goodreads community to imbue this with an appropriate rating. Nancy Drew could probably bake a beautiful pie, crochet an afghan, tutor French, write a column on comportment and change her little blue convertible's oil all in the same afternoon. I hate her perfectness, but I love her courageousness and cleverness. This was my first Nancy Drew, I just didn't grow up reading her as many do. I chose this book for my mystery square because it had elements that fit the theme of the Halloween book bingo - a haunted mansion and a thieving ghost. It was cute and quick and ended well. You can tell what's going to happen about a mile away though. I think the biggest mystery for me was how you prepare gelatin and then immediately eat it (doesn't that have to set for a couple hours?) or how you would make cream of chicken and rice soup with a can of soup and milk (replace the water with milk?). I was clearly more interested in what they were eating than the mystery. Maybe I was just hungry? But anyhow, I owned and read about 20 ND books and this was the first, and to me, the best. I learned about coupes and pumps, too. Loved these books. Well I just re-read this book, found my old, original copy while pulling Christmas decorations out of a closet. Published in 1930, it belonged to my mother, not my sister. Though it may not be a first edition, I'm fairly certain it's the original story. Nancy drives a 'roadster,' has 'bobbed' hair and is amazed when a friend has an 'electrical refrigerator.' She pumps water to get her father a drink. (But not in her own house, someone else's.) And she stays with two elderly women for awhile who do not have a radio, electricity or a phone in the house. Sounds 1920's-ish to me. The story is full of many dated references, too, as in a colored woman who calls herself 'culled' and talks in an exaggerated and - to be honest - uncomplimentary, very deep South accent. The woman is often referred to as a 'negress' and is written as being very fearful and not too smart. The main villain, a man, is also very stereotypical. He's nasty, short and sort of brutish. One more little aside which amazed me. Nancy's father, prominent lawyer Carson Drew, GIVES Nancy a loaded revolver to protect herself. This guy goes from one extreme to the other: here's a gun and oh by the way, be careful. Nancy then admits she couldn't hit the broad side of a barn if she tried yet she carries the thing around and sleeps with it under her pillow. Cliches, much? I listened to this on audiotape in my car. I originally put this book on here a few years ago to represent my love for Nancy Drew, since this one was my favorite. Upon my "re-read", I found this to still be a fun story. These are definitely dated books, but they're timeless in my opinion. Nancy can really be annoying sometimes, though. Is there anything she's not perfect at? I clearly have to give this 5 stars due to my love of this book as a kid. (original review: I listened to this on audiotape in my car. The Good: As you might expect, this is more of the same that the premiere Nancy Drew novel delivered, but, that isn't a bad thing. The usual suspenseful scenes and twists and turns that have taken place in many a mystery are present here...and that's just what readers are likely expecting. Nothing really to complain about. The Bad: While there weren't any serious issues, this book wasn't outstanding, which is why I'm only giving it four stars. • The Good: As you might expect, this is more of the same that the premiere Nancy Drew novel delivered, but, that isn't a bad thing. The usual suspenseful scenes and twists and turns that have taken place in many a mystery are present here...and that's just what readers are likely expecting. Nothing really to complain about. Conclusion: As usual, I'm late to the party, but, I still enjoyed this second volume of an insanely long series. 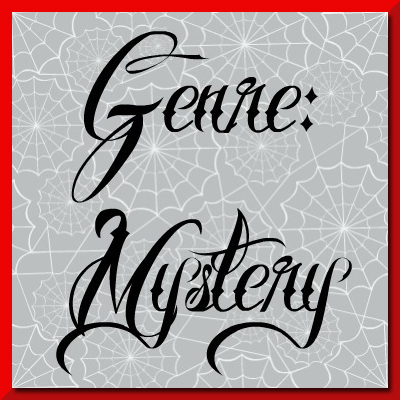 Mystery fans who have yet to check these books out definitely should. Moram priznati radnja je ovde dosta interesantnija i fina ideja mesanja uklete kuce i pokusaja pronalaska nestale osobe. Ali opet je glavni problem sto je relativno naivno. Sada tu problem nije u knjizi posto je ocigledno pisana za mladju publiku negu u meni posto sam ocito davno prerastao ovaj serijal. Generalno mogu da preporucim knjige al ja ih necu citati dalje. I loved Nancy Drew as a young girl. This was the first one I ever read. Welp, I read another YA novel! I love the fact that my last three books have women characters that are really brave and great. Love it. Girl power💪! I just finished a bizzarro version that was written in 1930, prior to the edits and whitewashing that re-did the Nancy novels in the 1950s. Ah, mass-market paperbacks. Write a book twice and sell it to two different generations. Offensive racial stereotypes? Take them out and pretend they never existed! But of course Now I Need to find the more recent version of Hidden Staircase to figure out what got changed. Nancy Drew is so cute and compelling, dammit. A real plucky go-getter. ~~~~~~~~~~~~~~~~~~ I just finished a bizzarro version that was written in 1930, prior to the edits and whitewashing that re-did the Nancy novels in the 1950s. Ah, mass-market paperbacks. Write a book twice and sell it to two different generations. I can confirm that the revised edition of The Hidden Staircase is even MORE ridiculous than the first one. In the 1950s Nancy has a friend named Helen who helps investigate. During the plot, Helen excitedly explains that her boyfriend has written her a letter, and they are now engaged to be married! Yippee! Also, instead of two elderly (spinster) sisters owning the mysterious "haunted" house, the women are now a (widowed) aunt who has moved in with her elderly (of course widowed) mother. The women are certain to conduct their domestic duties EVERYDAY, even though their lives are in danger and unknown beings are in their house threatening their mental health. No, Nancy, we can't go sleuthing for clues right now. We need to vacuum the floors and wash the dishes first!!! Also, we need to go marketing, both to feed ourselves and the "ghost" who is stealing our food. Good gawd, ladies! Get the heck out of there! But no. When the mystery is solved, and luckily after Nancy's dad Carson Drew is found in a nearly airless room, heavily sedated, the girls' first idea is to prepare a nice lunch for everyone. This was the very first Nancy Drew book I read. One of my grammer school classmates gave it to me--sometime when I was in the sixth grade? Anyway this book led me into a world of Nancy adventure to beg and borrow for more. At that time the libraries rarely carrie This was the very first Nancy Drew book I read. One of my grammer school classmates gave it to me--sometime when I was in the sixth grade? A cute read for what it is, but really this is so unrealistic that it is almost laughable. The father is kidnapped, Nancy believes he is probably being held prisoner somewhere, drugged, etc., yet she just continues to go nonchalantly along trying to solve the mystery of the ghost in her friend's mansion, with her father just being a sideline thought. Really??? If someone has been kidnapped and missing for many days, THAT should be your TOTAL focus! Hello! But she is having too much fun driving a A cute read for what it is, but really this is so unrealistic that it is almost laughable. In the midst of all of my serious group reads, one part of my brain was like, "What's that Nancy Drew book where she runs up and down a staircase to figure out which steps don't creak?" I had to read it again immediately despite having read it probably 52 times when I was young. Nancy knows how to get an owl out of a room! Hannah Gruen cooks a four-course meal no matter what the hell goes down! The bad guys are always scowling! What's not to love? (It seems unfair to give a formulaic ghostwritten In the midst of all of my serious group reads, one part of my brain was like, "What's that Nancy Drew book where she runs up and down a staircase to figure out which steps don't creak?" I had to read it again immediately despite having read it probably 52 times when I was young. Nancy knows how to get an owl out of a room! Hannah Gruen cooks a four-course meal no matter what the hell goes down! The bad guys are always scowling! What's not to love? leslie hamod You are more than welcome! 94th book read in 2017. Number 348 out of 658 on my all time book list. GHOSTS!!! Not as good as book one but still fun. As a kid my mom would take us to the local library, which was in a fantastically ancient house on Main Street. The comforting smell of old books, ink, and wood polish combined with the sacred hush and shrewd eye of the a-social librarian made these trips feel sacrosanct. To get to the children and youth section, you climbed a set of echoing, wooden stairs which, no matter how hard you tried to tread softly, elicited a reproachful stare from the (presumable) spinster at the desk. Upstairs, in one As a kid my mom would take us to the local library, which was in a fantastically ancient house on Main Street. The comforting smell of old books, ink, and wood polish combined with the sacred hush and shrewd eye of the a-social librarian made these trips feel sacrosanct. To get to the children and youth section, you climbed a set of echoing, wooden stairs which, no matter how hard you tried to tread softly, elicited a reproachful stare from the (presumable) spinster at the desk. Upstairs, in one bright corner room were picture books - all stacked in wooden bins. When you raced over to take a look, the floor boards creaked and moved beneath your feet. In the adjoining room were the chapter books, lined impeccably on shelves. I remember being in awe of them, imagining how smart and sophisticated one would have to be to check out such "hard" books. And in this room, lined in beautiful symmetry, was the Nancy Drew mystery series, hardbound. And, just below them, in volumes of identical size and width, were the Hardy Boys. That was many years ago, and so when I took my own children to the new, brick, streamlined library in town that replaced the old one (but could not replicate its charm), Nancy Drew was displayed now on audio. I picked it up and as all of us listened, the simple story of a girl detective and her friends came rushing back to me across the years. Nancy’s friend, Helen, and Helen’s Great-Aunt Rosemary ask Nancy to solve a mystery at her great-grandmother’s home, Twin Elms, a stately Colonial mansion in nearby Cliffwood. And Nancy is determined to check it out until she hears that her father is being threatened by crooked lawyer Nathan Gomber, who feels Carson, as attorney for the railroad, cheated property owners near a new railroad bridge. Carson Drew, Nancy’s father, tells her not to worry and Nancy and Helen go to stay at Twin Elms whi Nancy’s friend, Helen, and Helen’s Great-Aunt Rosemary ask Nancy to solve a mystery at her great-grandmother’s home, Twin Elms, a stately Colonial mansion in nearby Cliffwood. And Nancy is determined to check it out until she hears that her father is being threatened by crooked lawyer Nathan Gomber, who feels Carson, as attorney for the railroad, cheated property owners near a new railroad bridge. Carson Drew, Nancy’s father, tells her not to worry and Nancy and Helen go to stay at Twin Elms while Carson goes to Chicago to find Willie Wharton, who is holding up the proceedings by hiding. On the girls’ first day, a chandelier sways by itself. Miss Flora is missing items, music comes out of nowhere, and a gorilla is seen peering in a window. After Nancy confers with the local chief of police, an officer named Patrick is assigned to patrol the grounds while Nathan Gomber repeatedly harasses Miss Flora and Rosemary to sell their property to him. When Nancy’s father fails to arrive on schedule, Nancy becomes worried, later finding out that her father was kidnapped. As she rushes to find him she also finds a connection between her father and the ghost of Twin Elms. Once again, the title gave it away but I thought The Hidden Staircase was much better than The Secret of the Old Clock. Even though this one moves a lot slower and most of the drama occurs in the last three chapters, there is an actual mystery here that has much higher stakes. After all, Nancy’s father is kidnapped. VERY GOOD BOOK! i love this one! This is a very easy book to read I read it all in one day. A very good classic. Such a thriller, chills came down my spine as if I was in the moment of the book. "STOP! YOU CAN'T GO UP THERE!" 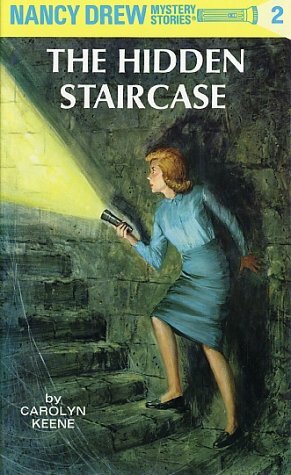 Nancy Drew was one of my early role models! I always loved reading these mysteries and all the peachy keen details. This one has a haunted house and Nancy's father mysteriously disappears! Once again the savvy teenage sleuth is drawn into intrigue and danger. Always nice to visit the pages of a favorite from childhood!